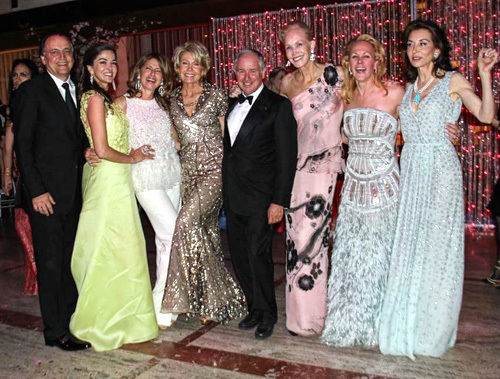 Left to right Real Estate developer Paul Kanavos, socialite Dayssi Kanavos, philanthropist Kalioppe Karella in Chanel, philanthropists Christine and Steve Schwarzman, Joanne de Guardiola in Tom Ford, socialite Muffie Potter Aston, and socialite Fe Fendi wearing Dennis Basso. Lauren Gaudette and male model Garrett Neff both wearing Ralph Lauren. Designer Prabal Gurung principal dancer Misty Copeland in Prabal Gurung. Miriam Weiss and Lieba Nesis. The opening of the Ballet began with “Sylvia” choreographed by Frederick Ashton and starring Gillian Murphy, who is celebrating her 20th anniversary and contained young beautiful dancers. Next we were treated to an excerpt of “Sleeping Beauty” choreographed by Marius Petipa with additional choreography by Alexei Ratmansky with Veronika Part, Hee Seo and Cory Stears dancing the principal roles. These ballets were pleasant and light and followed up with “La Fille mal gardee” choreographed by Frederick Ashton and containing some ribbons and a pas de deux with Isabella Boylston and Jeffrey Cirio. Then we were awed by the physical prowess of 53-year-old Alessandra Ferri who danced in Kenneth MacMillan’s “Requiem” (Pie Jesu) with accompaniment by Soprano Ying Fang and conductor David LaMarche.